Find hotel near Botanicka Zahrada Bratisl ..
A plant lover’s favorite, the Botanical garden in Bratislava is home to more than 4000 species, all taken care by the student of Comenius University! 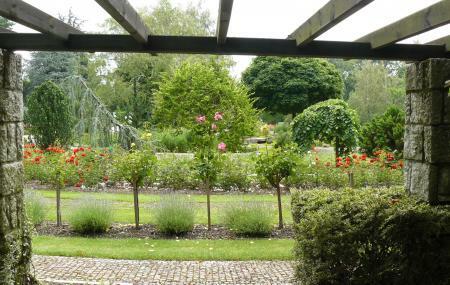 The gardens are divided into two- the outdoor gardens and the greenhouse. The place is loved for its fruits and flowers which are spread across the whole area and small nooks and benches where you can sit as you soak in the sun on a warm day. If you are looking for a green and quiet place in the city, this is it! Carry drinking water and snacks with you. How popular is Botanicka Zahrada Bratislava? People normally club together Bratislava Old Town and Devin Castle while planning their visit to Botanicka Zahrada Bratislava. Bratislava's Botanic gardens are only a 30min walk from the historic old town. Plenty of areas to sit, relax and have a picnic here. Definitely worth visiting in spring/summer period. No entry fee and bathroom facilities are inside the gardens. Affordable, visually stunning and accessible place with cosy atmosphere. These gardens are perfect for relaxing. I strongly recomend spending a whole day here. You can walk here from the city centre via the water front. The area is kid frendly. Great! Plants are really well labelled. Super greenhouses. Refreshments available. Good paths so very accessible. If you are into plants it's a must and if you aren't it's a very pleasant and peaceful place for a walk. Nice place full of green. You get exactly what what you expect from the botanical garden. I recommend you to go and check it out. It's totally worth it.